Spoiling newborns is a question a lot of new moms have. 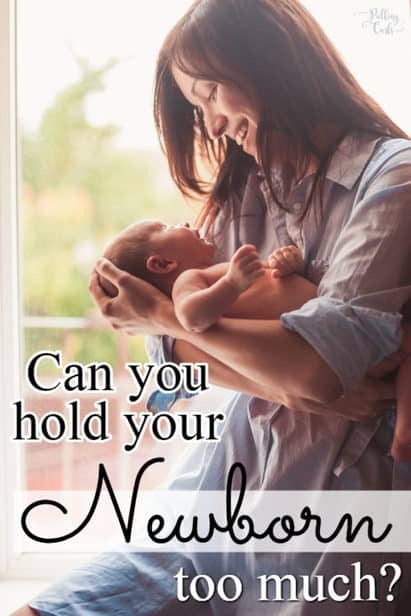 CAN you hold a newborn too much? Is it OK to hold them while they sleep? What are the benefits from all that holding? First off, I want to state categorically that mothers are born with instincts. One of the saddest things about delivering babies in the hospital is that I think we remove a lot of the instinct, by us following research and having safe patterns of practice. When I hear home birth stories I get chills. Your body knows what to do (for the most part, and as an L&D nurse I still believe strongly that hospital births are the safest). BUT, you — as a mom — you have this baby. You don’t have your friend’s baby and your particular baby has his/her own unique needs and wants. You were given them for a reason. Am I enjoying holding my baby this much? If the answer is yes — then hold away. Love, and snuggle them. You’re that baby’s mom and clearly, it’s working for the both of you. I can’t even imagine what it’s like coming out of the womb into a loud, bright, cold place. I’m sure having your mamma and her heartbeat nearby. It is natural to want to hold and protect them from the changes. BUT, if the answer is no — then that’s OK too. I didn’t have particularly snuggly babies and I felt fine putting them in the bouncer or a blanket. I was adamant about tummy time (even though they cried the whole time for the first few days). I didn’t feel the need or desire to hold them all the time. So, I didn’t. That’s fine too. 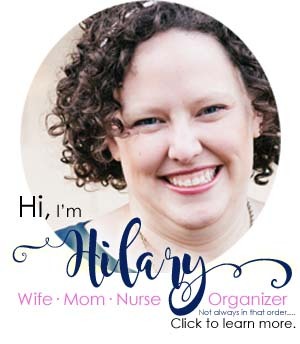 **I will say that if you have zero desire to be around your newborn, to hold them at all or deal with them — that’s another problem, and you will want to talk to your doctor. It’s not unusual, but you may need some help. What is the newborn phase? First, I think we need to specify what the “newborn” phase is. I think it is about from birth to 2 months. After that, you have a baby — not so much a newborn. They’re getting the hang of living in the air-breathing world. They’re more aware, interactive and happy to live here. By that, I mean holding them while they sleep. Some babies, supposedly, will only sleep while they are held. I would say that nothing is wrong with that if you are OK with it. But, if you’re the mom that says I can’t even shower, and I’m dying. Then, put them down. Lay a blanket, or use the bouncer, close to your shower and just pop your head out every few minutes and peek at them. Even if they’re crying, they will be OK — because you are crying inside for a shower. You are a human, you deserve that. Newborns feel safe and secure when they’re being held, but you can mimic that feeling with a swaddle as well. Help with breastfeeding — it’s easier to see hunger cues when they’re just a few inches away from you. One of the hardest things is when you have a baby that you feel needs you close, but you have other kids. You can’t exactly always meet the baby’s needs and not meet their needs as well as feed them. I LOVED babywearing, especially on my 3rd who just seemed to need me closer. Because my babies were really active I never felt safe with them in a sling (could easily have been user error). I also never got the hang of Mobi wraps where I had to so straps over all my body. In the newborn phase, I used a Bjorn. You can often find these cheaper (because they aren’t comfortable as long) in kid’s second-hand stores. That’s just what worked best for me — but I’d ask around, and maybe try a few friend’s to see what you think will work for you. The research all seems to point to no. You can’t spoil them. 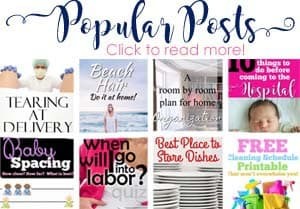 However, this post is about spoiling a newborn. I didn’t actually find many studies that took the amount of time in mom’s arms for the first 2 months and coping/ life skills later on. So, take that for what it is worth. In this, I mean you being asleep and holding the baby. And I am 100% against this. I am against co-sleeping in general, but actually holding your baby while you sleep is a big no-no. You can so easily drop them (this happens frequently at hospitals, even though we consistantly remind moms to put the baby in the bassinette if they need to slee), or roll over them. You can’t imagine the torment of a mom who’s smothered their baby. That’s it. That’s all. I’ve seen it, it’s horrible. Put the baby in a bassinet or a co-sleeper. The end. 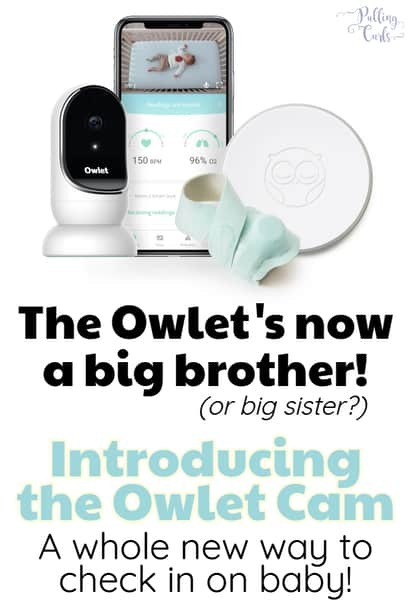 So, nope — I don’t think you can spoil a newborn. Did I hold my newborns all the time. Heck no. I followed an adjusted Babywise schedule that was basically, eat, play sleep. It worked for me. It worked for my babies. They were happy and healthy. I wasn’t losing my mind. I was grateful for it. My daughter ennjoyed being held more than my boys did. I adjusted to a spot where we could both be happy. Can you spoil a baby (baby, being after 2 months)? Honestly, after watching moms in the last 18 years that I’ve been a mom. I think you can. But, I also think they can pretty easily be “un-spoiled”. It is easy, in all facets of parenting, to get your child into a routine that you don’t want to continue. Kids not doing their jobs, kids staying up late. All of those are problems that you’ll have to fix at some point, if you don’t want them to continue. Again, is what is going on working for you. If not, make a change. Babies do need lots of hugs, and attention. They need lots of YOU. But, you also need to live your life. If something you’re doing or they seem to “demand” isn’t working for you. Make a change. Babies can be put down and they may cry. That is OK. I had one baby who had to cry for 3 minutes every night before he went to bed. As a teenager, he needed to argue with me for a few minutes before bed 2 or 3 times every week. It’s just the way he was wired, just wants to get it out. Babies mostly need a happy mom who is enjoying raising them and their journey together. 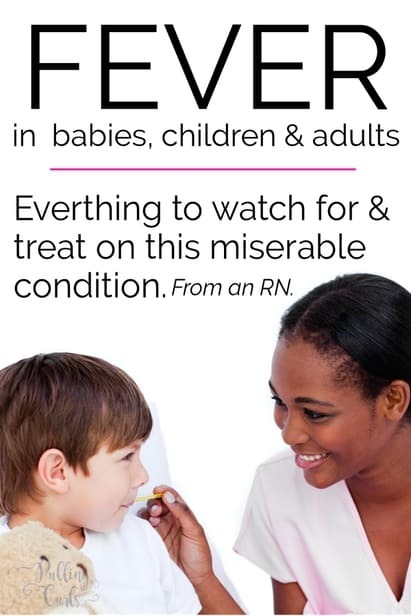 How to Fix a Fever: Children, fevers and how to fix them! 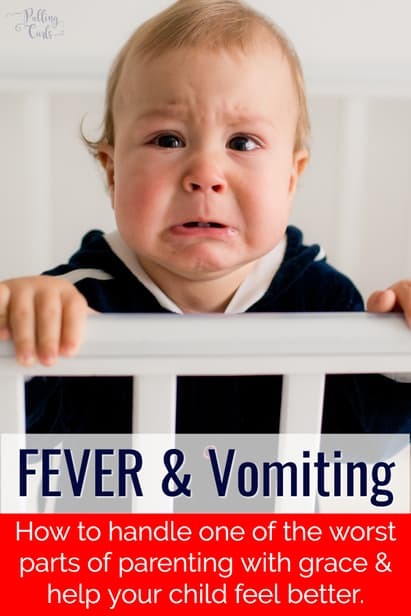 Fever & Vomiting in Child: Babies, infants & toddlers vomiting with a fever — when to worry, what to do.